because they are afraid of spiders. finds a spider crawling across her desk? to crawl onto a business card for his close-up. Oh how I love my co-workers. Without them, I'd go crazy. 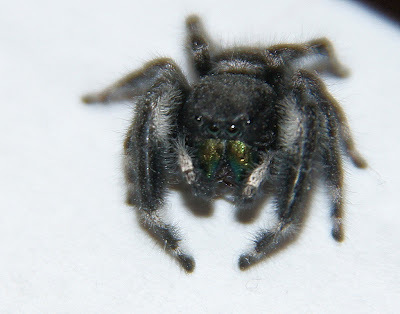 I think he's kind of cute, for a spider that is. You've got some pretty cool co-workers. Splendid picture - I find spiders both fascinating and spine tingling at the same time - and we have some fine ones down here! For reals? I'm pretty sure I would not have been able to handle that! I don't mind spiders, as long as I don't find them crawling on me! Spiders are wonderful critters with the exception of a few. I love you and your coworkers' response to the spider. Great shot. That's cool, around her everyone yells for me to take care of the spider then get all anxious that I photograph it before sending it on it's way.